This year's new 2013 recycling data released by the Florida Department of Environmental Protection shows Florida's official recycling rate is now 49 percent, up one percent from last year. This represents a substantial increase in the amount of solid waste recycled -- from 9.7 million tons in 2012 to 11.8 million tons in 2013. 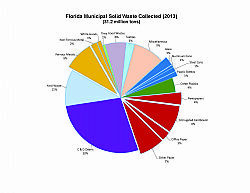 Lets keep up the great work Florida and achieve the 75% recycling goal by 2020!